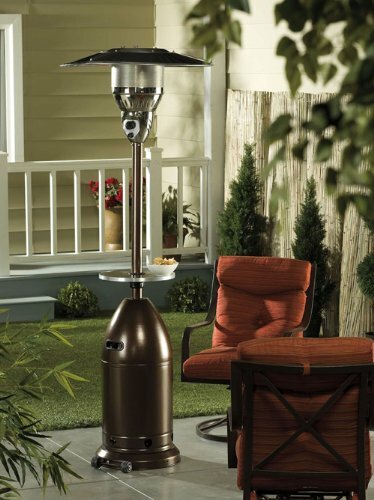 Outdoor Standing Propane Heaters Add to Flipboard Magazine. I know that no one is ready for summer to be over, so lets fight it as long as we can by using outdoor standing propane heaters. I am sure you have seen them at restaurants and events, but these are affordable enough to have on your own patio. You can extend the amount of time that you use your patio with these great standing heaters. When they are not in use, just put a cover on them or wheel them into the garage. They use propane which is easy to get these days. This is really the perfect solution to warming things up on a cool night. Standing propane patio heaters produce more heat than electric or gas-fueled table models. The average standing propane heater is rated at 40,000 BTUs an hour at maximum setting, but some can produce 45,000 BTUs or more. A 40,000 BTU an hour patio heater can radiate heat over a circle about 18 to 20 feet in diameter. The heaters are usually about 6 or 7 feet tall, topped by domed cap that directs the heat downward in a 360-degree radius. The propane tank at the base is hidden, either by a skirt or by a metal base. You can buy commercial units, but if you think you will use a patio heater about 26 hours a year or three hours a week for about two months of the year, then a residential patio heater should be perfect for you. It will last longer if you purchase a cover for it (about $40) and disassemble the heater between seasons to store indoors. This beautiful radiant heat glass tube outdoor patio heater is 91 inches tall and has a hammered bronze finish. It features wheels so it is easy to get it from the storage area to the patio or to wheel it from place to place around your patio or backyard. It has 40,000 BTU’s, with a variable control so it is easy to set the temperature to be comfy. It is made to use a 20 lb propane tank, but one is not included. A fancy bottom makes this heater stand out from the rest. So if looks is really important to you, check this one out. It has an adjustable heat output with up to 40,000 BTUs. Featuring an electronic ignition which will make lighting fast and easy. You can use either propane or natural gas with this heater. I love choices! If you have a formal patio and really want to have a propane heater that coordinates with it, these are some good choices in a high end propane patio heater. The look is sleeker and gives the idea of something much more than just a propane heater. This should get your started on your adventure of finding a great propane standing heater for your patio. If after seeing these you think you might want to go with something else on the patio, check out these great fire pits/fireplaces.